USA outlasted Morocco 9-4 in a spirited match on Sunday, August 5th, 2018, the fifth international faceoff of the NBC10 Newport International Polo Series 27, presented by BMW. With Moroccan and US national flags rippling over the pitch, the national anthems of both countries followed the introduction of players. Wearing white and red for Morocco in the #1 position was Imad Ounnisi, with Karim Drif at #2, Taissir Kadiri at #3, and Nour-Dean Anakar at #4. Representing USA in navy was Michel Nseir in the #1 position, with Minnie Keating at #2, Dan Keating at #3, and Peter Friedman at #4. D. Keating put team USA on the board first with the lone goal of the first chukka. Friedman followed suit for USA and scored two consecutive goals in the second chukka to give his team a 3-0 lead. Kadiri finally responded for Morocco, putting them on the board with a 2-goal deficit at the end of the second chukka. Morocco gained momentum, and Drif and Ounnisi were able to score two goals to end the first half in a 3-3 tie. USA began the second half firing, with two immediate goals from Nseir to put his team up 5-3. The father/daughter duo of D. Keating and M. Keating scored two more goals for USA in the fourth chukka, putting the navy team in a 7-3 lead. 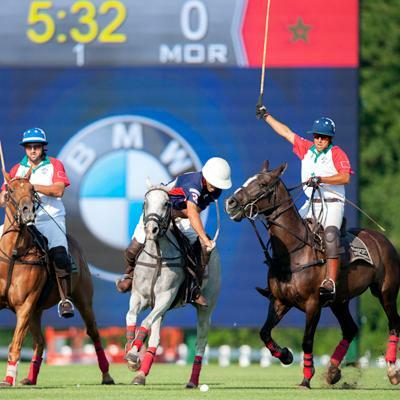 The fifth chukka began with Friedman's third goal of the match, which was answered with a goal for Morocco by Kadiri. Nseir scored his third goal at the beginning of the sixth chukka, which gave USA a 9-4 victory over Morocco. During the match, a lucky lady from North Kingstown, Rhode Island won a magnum of Veuve Clicquot Champagne in the weekly door prize drawing. An extravagant tailgate party in space 68 wowed the judges by decorating their tailgate with a Moroccan theme. Specialty vendors and concessionaires were present in the Hospitality village at the polo grounds, and included the Twisted Pony Cocktail Bar, Newport Polo Pro Shop, Flint & Flame, and gourmet food trucks. After 6 chukkas, the match concluded with the Veuve Clicquot Champagne Toast & Trophy Presentation, as well as an autograph signing to meet the players. The USA vs. Morocco Cup was presented by Daniele Barbi, Director of Hospitality at Gurney's Newport Resort & Marins, host of Team Morocco. While in Newport, the Morocco Team enjoyed many of the best attractions and highlights in the City by the Sea, including riding in style in a BMW X5 SUV; Newport Mansion tours; Secret Garden Tours of Newport for exclusive access to the private gardens of Newport's Point District; a glorious sunset sail; Sightseeing courtesy of Scooter World; Tennis on the legendary grass courts of the International Tennis Hall of Fame; Paddle boarding with Island Surf and Sport; cocktails & dancing at the Season Kickoff Bash on the eve of the match at the one and only Clarke Cooke House, and all the great goings on in the City by the Sea.